Finding the right accessories is all in the design basics: It’s about balance, proportion, color, and then adding touches of texture here and there. Below are some tips on how to accessorize your home—with a nod towards the crisp autumn days we’re enjoying right about now. Every room needs at least one mirror—for sparkle and to make the space look bigger. 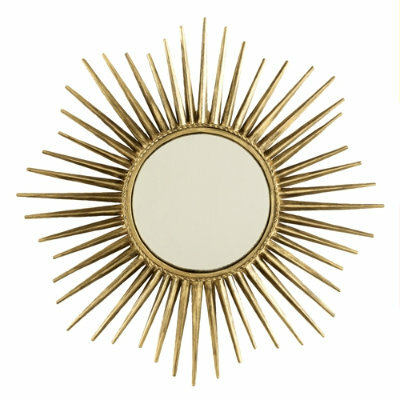 My favorite style of mirror is a sunburst style mirror. 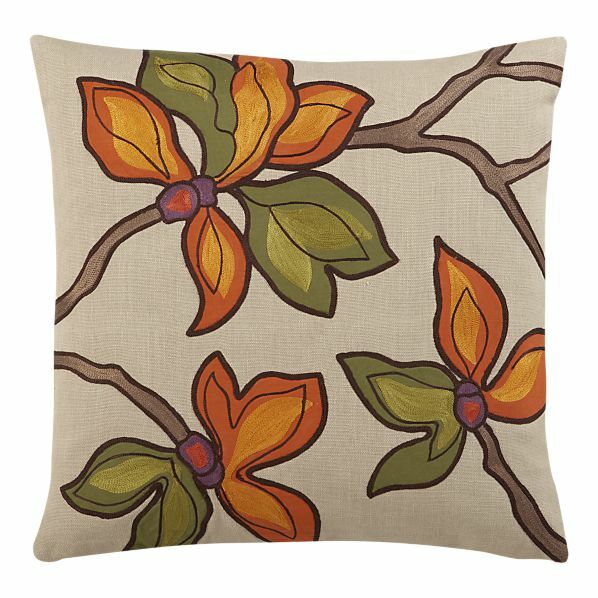 Very dynamic, it will add a stylish element to your home. 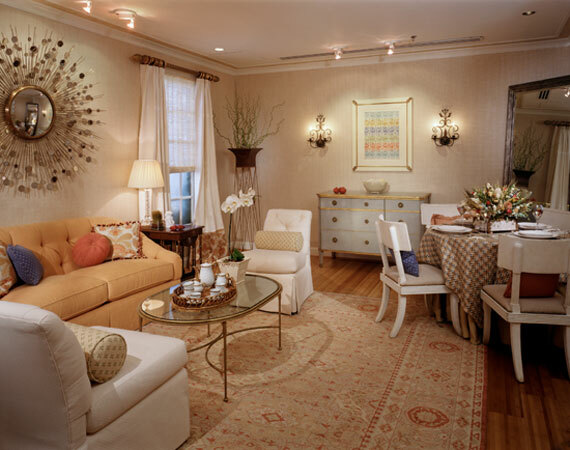 A room I designed for the Washington Design Center's Design House, in which I used a large sunburst mirror as a focal point. 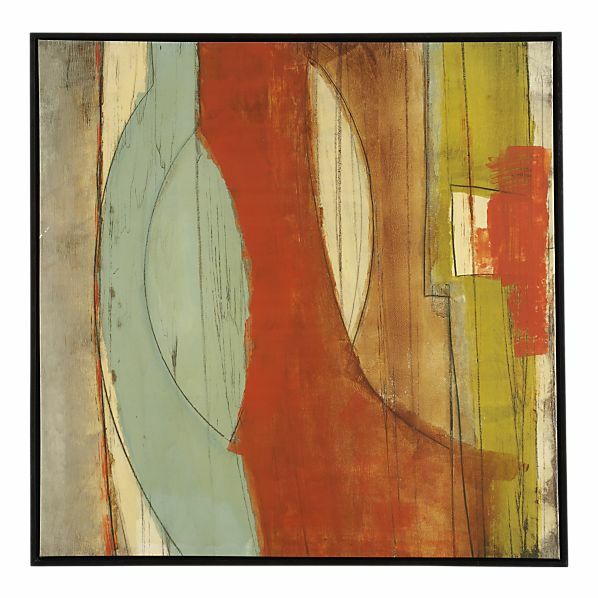 A mirror by Suzanne Kasler for Ballard Designs. This mirror is about as dynamic as you can get. Hang it above a chest or console table and add some of the accessories below, which reflect the fall season, to finish the look. Here are some of my favorite accessories this season. 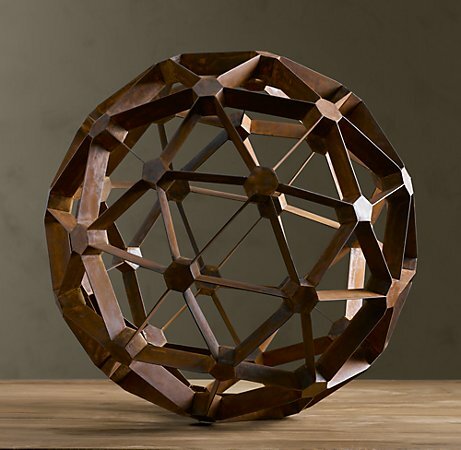 An interesting accessory from Restoration Hardware. 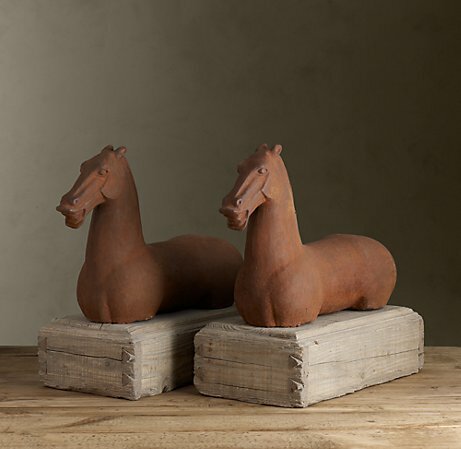 A pair of cast iron Han Horses, also from Restoration Hardware. 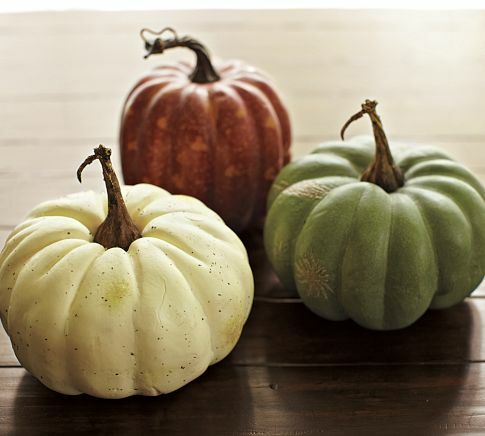 Multi-colored pumpkins from Pottery Barn. 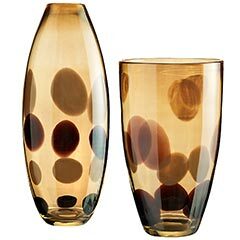 Amber Luster Glass Vases with Dots from Pier One. 1. Floor plan, floor plan, floor plan! This is the roadmap for the rest of your design. Once you understand the floor plan and the scale of the room you can select furniture that is well suited for the space. 2. Select permanent finishes – tile, wood flooring or carpeting – that stand the test of time. These are the finishes that you will live with for some time so don’t select anything that is overly trendy. 3. Choose a rug that fits your palette. If you are considering a patterned area rug make sure your selection works with the permanent finishes that you have chosen. 4. Furniture and Fixtures – start searching for your furniture and fixtures with a defined shopping list to guide you. Collect pages from your favorite design magazines with pictures of rooms that you love. 5. Look for fabrics that compliment the furniture pieces you chose and look for your soft-goods — draperies and pillows. 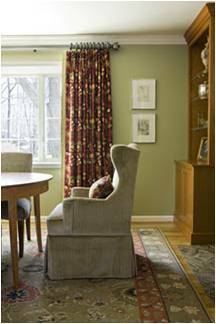 As you are shopping for these fabrics use samples of your permanent finishes and your rug colors as a guide. Size usually makes it impractical to drag an area rug with you as you shop but don’t rely on photos alone because they never produce accurate color. A good tip is to match paint chips to the colors in the rug and staple them onto the photo for reference. 6. Once you’ve decided on your design and finishes now you can consider your color scheme. Wall paper, faux finishes or paint – there is a limitless palette of paint colors out there. Take all of your finishes with you and find a hue that compliments what you’ve selected, but doesn’t take center stage. If you are hesitant to go bold throughout the entire house, pick a room and take a leap of faith! Ask for a low-VOC or no VOC paint. These paints have had the toxic chemicals that are used as drying agent removed or reduced and as a result they are much healthier for your home. 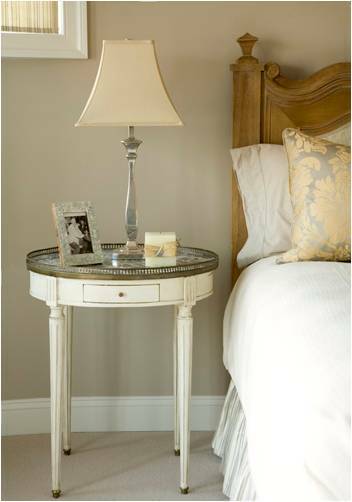 Paint is the least expensive change you can make to your room however it can provide the perfect finishing touch. Invite list…theme…food…drinks…lighting? Chances are, when planning a gathering at your home, lighting doesn’t make the to-do list. However, lighting can be an important supporting player for a successful party. It helps establish the mood, create a vibe and highlight your home’s best features. Where do you start? Begin by envisioning the areas where you entertain from your guests’ vantage point. You want guests to feel welcome right from the curb. 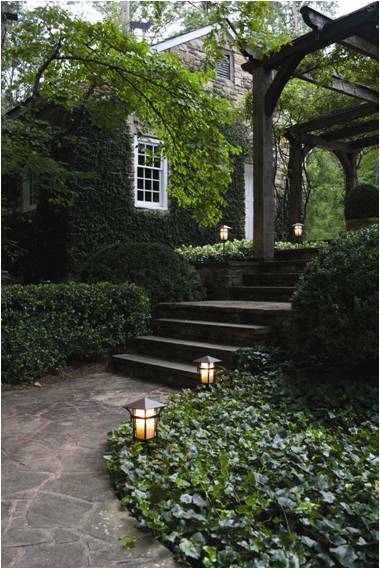 Consider installing decorative, energy-saving, low-voltage landscape lights to illuminate a path to your door. Not only is this important for safety but it also creates ambiance at night. After your guests have walked through your beautifully lit landscape, do not blast them with a bright lantern at the door. During a party, you can temporarily screw in flicker bulbs for an old-fashioned look or silk-wrapped bulbs that offer less glare. Look at the front of your property and decide which areas to highlight. Place lights in front of specific plants, trees and shrubbery to create interesting shadows. If you live in a neighborhood where many homes look alike, great outdoor lighting can make yours stand out. If the party is in the backyard, lighting can heighten the festive atmosphere. 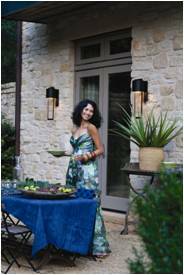 Gardens can come alive at night with strategically-placed uplighting, tiki torches, paper lanterns or string lights. The combination of foliage textures and garden colors can create an unforgettably romantic and mysterious atmosphere for your guests. Because the foyer is the first impression of your home, the space should be inviting and the lighting adequate enough for visitors to perform a quick check in a nearby mirror. For that reason, the light level should be similar to the rest of the house. Consider increasing foyer lighting as guests start to leave so they can find their belongings if stored in a nearby coat closet. Inside the living spaces during a party, remember that everyone looks better in lower levels of light (restaurants know this very well). When entertaining, there is no reason to over-light. 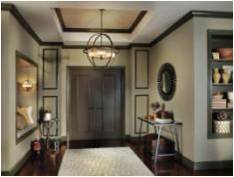 Use dimmers to provide lower light levels for recessed lighting or chandeliers. If your lamps aren’t equipped with three-way switches, there are lamp dimmers on the market that will help you control the amount of light in the room. In the kitchen, layering of different types of lighting is important and dimmers can be your best friend. When you’re preparing for a party and cleaning up afterward, bright light is ok. However, during the party, do you really want to draw attention to the unglamorous aspects of entertaining? That’s when accent lighting works its magic and there are numerous techniques that may work for your kitchen. Examples include uplighting the soffits above the cabinets, highlighting a cove, undercabinet fixtures, toekick lighting or illuminating the interior of glass-fronted cabinetry. If you don’t already have a decorative fixture over the island or breakfast nook, it is a worthwhile investment. These fixtures supply helpful downlighting while also adding beauty to a utilitarian room. During the party, dim any pendants, island lights or breakfast nook fixtures to give a wonderful, subtle glow to the room. Turn off the overhead lights. If food will be available in the kitchen, keep the undercabinet lights on to facilitate serving. As well, lighting at the toekick and over the cabinets will add intrigue and interest to the room. In closing, guests may not remember the lighting in your home, but they will remember the mood and ambiance it creates. Have fun with lighting – it’s a party, after-all!